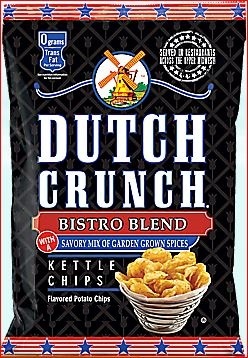 The Unique Bistro Blend is a savory mix of Garden Spices on our Dutch Crunch Kettle Chips. These delicious chips are served across the Upper Midwest in Restaurants. Our Bistro Blend will make any occasion a little more flavorful. 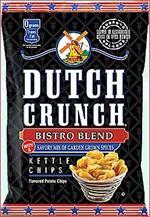 Ingredients: Potatoes, Sunflower And/Or Canola Oil, Salt, Contains Two Percent or Less of: Sugar, Dehydrated Garlic, Spices, Paprika (Color), Corn Maltodextrin, Autolyzed Yeast Extract, Dehydrated Onion, Chili Pepper, Extractives of Turmeric (Color).